Welcome to PMP Exam Bank, your one-stop comprehensive repository of all things related to PMP, by a PMP® professional that has passed the PMP® test many moons ago. I decided to start PMP Bank as I realised that there are various PMP-related resources scattered on the internet and it would help anyone studying or preparing for the PMP exam by having a one-stop portal. It is also my intention to make PMP a totally free website and supported by the occasional ads. If you would like to access a larger set of free questions as well as a detail breakdown of the PMBOK 5th edition changes, please proceed onto the new Mister Exam Study Portal using this link. The Project Management Institute (PMI)® recently released the official dates for when the Project Management Professional (PMP)® and some other of its exams will be updated to the latest standards. Here is what we have learned and our recommendations for studying. If you want the section-by-section details of the changes, refer to this link. Project Management PMP Bank is thus established in 2009 and rebranded in the last days of 2011, with the vision of providing FREE and BENEFICIAL resources to all Project Management practitioners. We have provided 2 good years of free Project Management resources with many more years to come. The Earned Value technique is broadly used as a performance measurement method for projects of any size. It enables a project manager to assess if there are variances from the base project plan that require some sort of corrective action. 3. Earned Value (EV): also known as Budgeted Cost of Work Performed (BCWP) is the value of the cost (calculated at the initial planned cost) of the work actually done so far. Some people like to think of it as the “physical progress of the work”. 3. 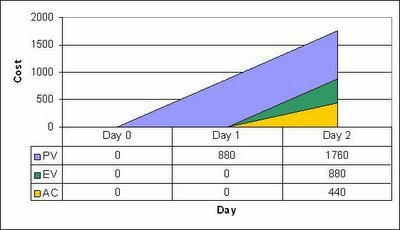 EV at day 1 is 100*8; at day 2 it’s equal at EV at day 1 plus 100*8; at day 3 it’s equal to EV at day 2 plus 100*8. So lets see what would be our conclusions each day. Since AC is greater than EV this would tell us that our resource is doing more work to get the same results. At day 2 that situation maintains and at day 3 the same result. So you could have act since day 1 to try to solve the situation. Another curious conclusion is that if we look closer at the results EV and PV are always the same. This tell us that we are actually on schedule and the project is going to finish at the planned date since the work actually done is always the same as the work planned. Great, now we can get a clear picture of the current project status instead of just hopping for the best. Lets look at one more example. So PV at day 1 is equal 100*8+10*8. PV at day 2 is equal to PV at day 1 plus 100*8+10*8. EV for day 1 is zero since no work was done. At day 2 EV is EV at day 1 plus 100*8+10*8. AC at day 1 is zero, at day 2 is AC at day 1 plus 100*4+10*4. 1. 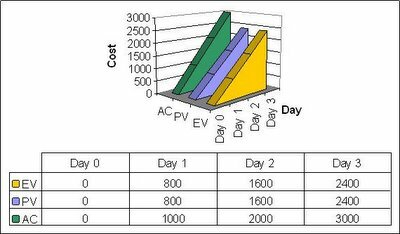 Since the work actually done (EV) is greater at day 2 than the work reported (AC) then we are more productive than expected;Since the work planned (PV) at day 2 is greater than the work reported as finished (EV) then we are behind schedule. 2. Since the work planned (PV) at day 2 is greater than the work reported as finished (EV) then we are behind schedule. The following is a basic Mind Map on the Project Management Prof Knowledge Areas, for easy diagrammatic reference. 6. PM Worksheets are very detailed, and is a MUST to understand which parts fall under which processes. Many questions will relate to these worksheets. 7. Once your revision is complete, do attempt the 400+ PM practice questions. 8. For those not familiar with PM body of knowledge 4th Edition, the Lessons Learned portion will be a good reference. 9. Last but not least, good luck! There are certain questions that contain extra information. This information is irrelevant and it does not relate to the correct answer. Beware of such questions and remember it isn't necessary to use all the information provided to answer the question. Beware of answer choices that represent generalizations, which may be characterized by words such as always,never, must, or completely; these are often the incorrect choices. Look out for choices that represent special cases. These choices tend to be correct and are characterized by words such as often, sometimes, may, generally, andperhaps. #1 - Fix the date for the PM exam. Take note that you need at least three months to prepare for the exam. #2 - Read PM Book thoroughly at least once. #3 - Read PM Exam Preparation written by the author RITA MULCAHY at least two/three times. #4 - Memorize the Sequence of the processes in Rita chart especially for initiate, planning and closing process groups. #5 - Revise the RITA MULCHY. No need to worry about the Tools and Techniques. (Hardly 10 questions). #6 - Try to do as many questions from the test bank as you can. Review those you have made mistakes and then retry the questions until you get 90% of them correct. #8 - Time, Cost, Human resources, Professional Responsibility are easier and very easy to score. #9 - Attempt all the questions in PMP Bank, and then find even more questions from our noteworthy links. #10 - Assess your score. Review the incorrect answers. #11 - Day before the exam, relax yourself. Do not read and take good rest. The exam is more on practical and not theory. If you are not in good mood, definitely you will face problems in answering the questions. #12 - Write the exam. #13 - Pass the exam. 5 Jan 2017 Lucy Tan "Finding the right free resource has been difficult and I am glad to have access to many PMP questions at your site." 18 Aug 2012 Vitram "Thank you for the free questions and in particular the PMP preparation worksheets." 23 July 2012 Riplan Vargesy "I have not been able to come across a comprehensive PMP resource site that is free, hence I am grateful to your sharing and the resources here." 22 Apr 2009 Sharma Anurag "Thank you SO MUCH for the valuable information on PMP Test Preparation." 14 Apr 2009 Tom F Junior "Just a quick note. Thank you for the questions and the process charts." 24 Mar 2009 Ivan Lim (Singapore) "Thank you for the free test questions and the studying process. I am sure it helped me to past my PMP test." 5 Feb 2009 Greta Buhr (Germany) "Thank you PMP Bank for the free questions!" 6 Aug 2009 Maria (USA) "I checked out your site and found it very useful and well designed. Are all the content and questions updated and in line with the PMBOK guide 4th edition? This would make sense in preparing others like me to really make use of this site....practice, practice, practice." This test is for self assessment only and no guarantee is given for passing the PMP®. No content from this site can be reproduced without the permission of the owner. The owner of this website is not responsible for contents of external pages via hyperlinks.